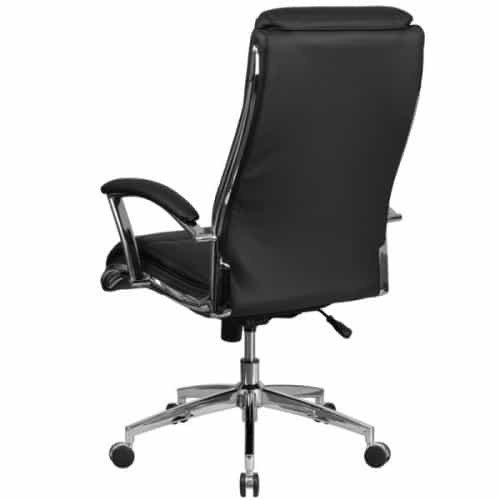 The Ultra Plush Leather Executive is a contemporary leather ergonomic chair. 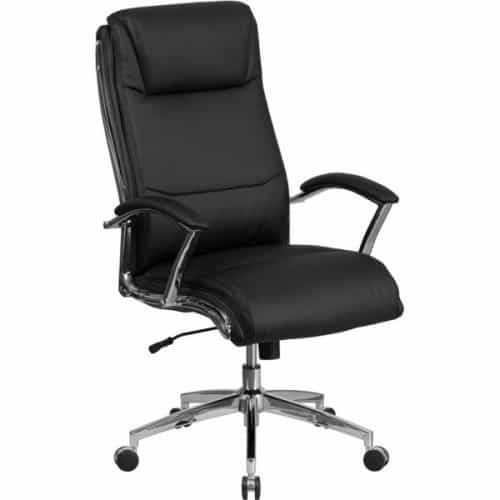 A leather ergonomic chair is hard to come by and we are excited to bring you the Ultra Plush Leather Executive. The chair comes in either black or white with polished aluminum base and trimmings to bring luxury to your home or office. The chair comes with a high back design with an ultra plush leather headrest. To make the chair both extra comfortable and ergonomic, there is built in lumbar support. The back of the seat is contoured to fit your back as you recline back or come forward, you will feel the back move with your body. The chrome trim borders will enhance the luxury of the leather to make this a great fit for any CEO or for any home decor. There is a tension knob along with a tilt lock mechanism to keep you upright. You simply adjust you tilt lock to allow yourself to recline and then push it back in to keep yourself sitting in an upright position. The waterfall seat promotes healthy bloodflow for your legs. Most luxury chairs will have a flat edge and will make your legs fall asleep. The chair comes standard with a swivel seat, pneumatic seat height adjustments, leather padded arms and dual wheel casters. Colors: Available in black and white with polished aluminum base and trimmings. Super comfortable chair for someone who needs added comfort on my hips and legs. I guess that is why they call it ultra plush. Great leather chair. I went to Beverly Hills Chairs looking to buy a refurbished Herman Miller Aeron. I sat in the Ultra Plush Leather Executive while I was paying for my Aeron. After paying, I actually decided to switch from the Herman Miller Aeron to this chair. I really liked to feature of the tilt lock on the Aeron and had no idea it was possible to have on a leather chair. It is the function that allows you to sit locked in different positions. I am very happy with my purchase, don't get me wrong, its hard to beat a Herman Miller Aeron, but I did love their promotional price. As an interior designer, this was the chair I have been waiting for to show to my clients. It is a leather chair, but it is also ergonomic friendly. It matches almost any decor and they chrome trim really shows well as a leather executive chair. This chair is incredibly comfortable and can be sat in for 8 plus hours a day. I went to see and inspect the chair to make sure it was everything it was advertised and it did not disappoint. I like the fact that the chair is extremely comfortable and still has ergonomic functions such as the tilt tension and tilt locks. Most ergonomic chairs have this feature to allow the person sitting in the chair to sit in an reclined then upright position. This chair allows you to sit how you please with a simple lever. The arm pads are also one of the hidden gems of this chair. They are leather and are extremely soft and it just really feels great when you arms are resting on them. I am very pleased I got this hybrid leather/ergonomic office chair. I prefer leather for my home office as it looks nicer with the rest of my furniture. The black leather is very comfortable and I am pleased to sit in it when I am trading from my home computer. I would highly recommend this chair. 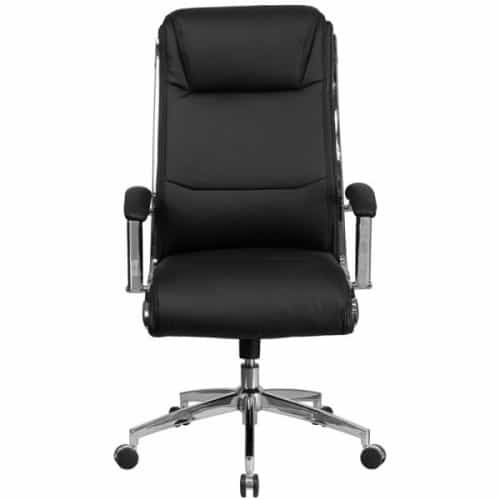 One of the top leather executive chairs you can find under $350. Beverly Hills Chairs runs promotional prices and that is when I snagged mine. The leather is very comfortable and the chrome trim really pops. Great chair.